Swazi Xtreme was first held in 2001. The event is organised by Darron Raw, director of Swazi Trails, an adventure activity operation (rafting, caving, teambuilds, community development) based in Swaziland. Originally from Pietermaritzburg, Darron has been living in Swaziland for some 20-odd years. Initially known for his white water kayaking skills, Darron has become a multidiscipline adventurer over the years. The first adventure race in which he participated was in 2000, the “Leopard-something” event organised by Bradley Weinand. That was when the bug bit. Anita, Darron’s wife, is Swazi Xtreme’s administrative power and can be found during the event commanding race headquarters. Sticking to the same rogainning and staged approach as successfully pioneered in 2008, the Swazi Xtreme went all out to tick off a few more “wish list” items in the 2009 year. This included easier seconding and transition points for back-up crews and being a more achievable event for slower teams. By all accounts this was achieved with very simple seconding requirements and a 100% finishing rate, the first in the race’s history. There was also no shortage of fun with a surprise coach trip into the capital for an urban orienteering leg, some tricky caving, white-water rafting, a big swim, canoeing and plenty of bouldering. The event started and finished at Mlilwane Wildlife Sanctuary, with both overnight transitions in the forestry village of Mhlambanyatsi. Navigation in the Usutu Forests was tricky and the night legs favoured the uncanny skill of Nic Mulder and his team Cyanosis who once again took the lead. Despite all efforts the chasing McCain Adventure Fanatics, entered the final day knowing that only a serious breakdown could sway the result their way. The tricky kloofing and rope ascent tasks and the ensuing descent back to Mlilwane did not provide this and they settled for being runner’s up. For a second year Aieesh.com put their stamp on the SPORT event, with Numa Optics and Gijima taking the PRO and SPORT pairs categories respectively. The 8th Swazi Xtreme saw a fundamental shift in race format. No longer was the event a flat-out race from A to Z, but instead teams were tasked with plotting routes to collect the maximum number of Optional Points (OP’s) available during the 5 stages of the event. The race kicked off after a monstrous rainfall, which saw tubing and kloofing legs abandoned. The race headed out from Sidvokodvo westwards on the watershed between the Ngwempisi and Mkhondvo River Valleys. Day One was brutal for both SPORT and PRO team. Night One was possibly the toughest in the races history, with teams Uge Cyanosis and Salomon Pro, pursuing a risky strategy of collecting optionals first and compulsory points second. This separated them from McCain Adventure Addicts. But it was the legendary “Do you want to win this race?” quip from Cyanosis captain Nic Mulder on the 2nd day’s undulating final MTB leg that saw the event shift their way, when he diverted his team to slog a massive uphill leg to claim useful OP’s and earn them a one point buffer, that they held through Night 2. Then it was a frantic rush for OP’s ahead of the 11h00 finish. The fast racing Salomon Pro team lead by John Collins did all they needed to do to win, picking up all points and getting in ahead of Cyanosis. However, Cyanosis matched this and arrived a nail-biting 1min 30s before stage cut-off to claim victory. The Pirow/van der Leeuw pairing took the PRO pairs category, Aieesh.com the SPORT team and Burnside Farm the SPORT Pairs. The new event format was a definite winner, with teams enthusiastic about the added competitiveness that it brought, including the stimulation it gave slower SPORT teams seeing the zig-zagging top teams repeatedly passing them. Surprises and curve balls hit both competitors and organisers in what otherwise could be considered as the Swazi Xtreme’s most ambitious race routing. A huge cold front hit on Day one plunging temperatures towards the minuses and making the first day from Waterford Kamhlaba College via Mpolonjeni and Ngwenya Peak to Maloloja chilly and later totally clouded in thick mist. The midnight kloofing of the Malotoloja potholes was meant to be AR at its most extreme, however the unexpected switching off of a hydro scheme and consequent flooding of Swaziland’s deepest and steepest gorge, meant that the Mkhomazana took this label without contest. Whilst Team Landrover USN led by John Collins beat the flood water thru’, the two chasing teams were halted with John’s brother Mark and Philip Swanepoel trapped between the proverbial rock and a hard place. The PRO event was halted and organisers and racers combined to assist the stranded pair to safety. The race was restarted they following day for an exhilarating 15km grade IV rafting stretch below Maguga Dam. Climbing out the Komati Valley and up to the Malandzela heights, the PRO racers caught up with the SPORT event – which for the first time this year were racing as a 3-day staged event – sleeping overnight in transitions. Well… those that finished in time did; others raced almost non-stop. The final MTB leg to Panata Ranch in the Swazi Lowveld was a fast leg along an interconnected ridge route; downhill MTB at its best. Cyclelab KZN took podium honours with Adventure Inc Red Ants second and Sterling Lite 3rd. The last curve ball and probably the cruelest of all, was the fact that the dominant Landrover USN had to pull out three hours before the finish, for medical reasons. A high attrition rate in the PRO pairs saw Team JEEP Voetsak’s Piers Pirow and Philip van der Leeuw as the only official finishers in this category. In the SPORT event, the overall winners were Team Wasp, followed by local Team Aieesh.com with Team Gifblaar taking third. In the pairs the Swazi Racing Snakes dominated. The 2006 theme was XL! (extra-large) and will be remembered for 3 reasons: an XL rafting leg, an XL waterfall climb and the XL antics of two celebrity participants. The 24km rafting leg on the upper Great Usutu, is normally run only by kayakers. Teams tackled that Grade IV obstacles in 2-man rafts. The Race Director learnt that no matter how much you warn competitors to scout rapids ahead of shooting them, the competitive teams are more scared of losing places than lives. Fortunately bravado was matched by skill and re-inforced with luck, so the only epics were the XL stories of carnage. “Vlok & Fordyce – On the Run” was a reality sports show sponsored by Jungle Oats, in association with Unite Against Hunger. Novice celebrities Bruce Fordyce and David Vlok were accompanied by AR regulars Lisa de Speville and Evan Price for a well-deserved 12th place finish. A dynamic TV crew captured every detail, giving great insights into AR and nice exposure to Jungle’s “food for a year” donation to 3 needy local primary schools. Mphophoma Waterfall, at the top of an inaccessible box canyon, was the last obstacle before the finish. So close was the PRO race that during this climb-jumar-traverse all 3 leading teams were on the face together. Nic Mulder and Powerade Cyanosis emerged triumphant again, followed by Graham Bird’s Duesouth and the very fiery Mitsubishi Red Ants. The SPORT event, although shorter, gave competitors a real test with most finishing well after the PRO Racers. Local team the Swazi Racing Snakes took the honours. We had kept the Bulembu area in reserve for a BIG Swazi Xtreme year. The village of Bulembu is an abandoned mining town, which we revitalised for our event. Named after the highest mountain in Swaziland, which is on its doorstep, the Bulembu area is characterised forests, remote gorges, underground tunnels and one of Swaziland’s best MTB routes – a steep descent into Mganda Valley. This was truely an area worthy of hosting our 5th year celebration. Two awesome ropework sections at The Gap and in the Mkhomazane Gorge and a swim and paddle section on Maguga Dam were features. As the winners arrived home and the accolades for a superlative course started being bandied about, our joy turned to sorrow in the news that a competitor in the PRO event had drowned in the Komati River after completing one of the rope-work sections. The event has halted shortly thereafter and all teams still racing were recalled to transition areas. The passing of Andre Raubenheimer was a sober reminder of the true nature of Adventure Racing and its supreme demands on mind and body. The 2005 PRO event was won by Nicolas Mulder and his Team Cyanosis, who had been hounded by both Graham Bird’s DueSouth and Cape Town-based Tension Structures. Local regulars Team Ngwenya Glass took the official honours in the SPORT event. Entries had grown to 62 teams, with 24 teams finishing, and 15 still racing when the event was halted. 2004 was the year that Team Mazda, came, saw and conquered. This winning South African combination of John and Mark Collins partnered with Martin Dreyer and Michelle Lombardi put their stamp on the last major Southern African event not yet listed under their phenomenal 4-year streak of exceptional performances. Though the race did not go all their way. At half-way they found themselves trailing Kinetic Transcor, with Teams Diadora and Jeep within striking distance. The event which took place largely in the vast Lubombo Conservancy area of North-east Swaziland featured: a leg through big game country with elephant, rhino and nearby lion; rugged hiking legs through thick Acacia thornveld; an infamous 15m kloof jump; abseiling and ascending from one country into another; challenging bike navigation and no shortage of thorns; a paddle section with angry hippos; a unique canal paddling section with forced low level bridge dunkings and a final 1.1 kilometre swim across a lake populated by crocodiles. Mazda finished the 220km course in 34h02, whilst Black Mamba took the 120km event in 22h20. Longer and with more options, the 2003 Swazi Xtreme offered two categories, a 120km SPORT event and 200km PRO event. Both races started with an early MTB ride to Swaziland’s oldest church at Mahamba. A circular loop over Mahamba Mountain with a 1km swim/kloof back through its sheer-sided gorge preceded a trek down the wild Mkhondvo River and scramble to the summit of Etjedze Rock. A chimney led to the summit where a 25m cable traverse brought competitors onto the point of a 40m finger of granite, where abseiling down was the only option to those without base-jump rigs. SPORT teams split here, missing out a notoriously steep uphill kloof, which was cursed by the PRO’s. An all night MTB route through the Grand Valley was lucky for some and unlucky for others, exiting at the Great Usutu River for some grade IV white-water and a suicidal leap down the 10m Holomi Falls. More trekking, MTB-ing and a scramble through the Kubuta Caves brought teams to the finish with a cumulative ascent of 9,522m and descent of 10,080m. Swaziland is not flat. Philip Swanepoel racked up his second win with Gerrard Booyens’ Team Tsunami. They had hauled in the early runaway pair of PJ Doyer and Tao Fineberg, who stayed awake long enough to pip previous pairs winners Piers Pirow and Phillipe van der Leeuw. Max Cluer with Sakkie Meyer, Sharon Lewis and paddling supremo Deon Bruss brought Datcentre Nissan home 2nd ahead of regular performers Kinetic Transcor. The BUG Girls surprised everyone steaming home as 4th team home. 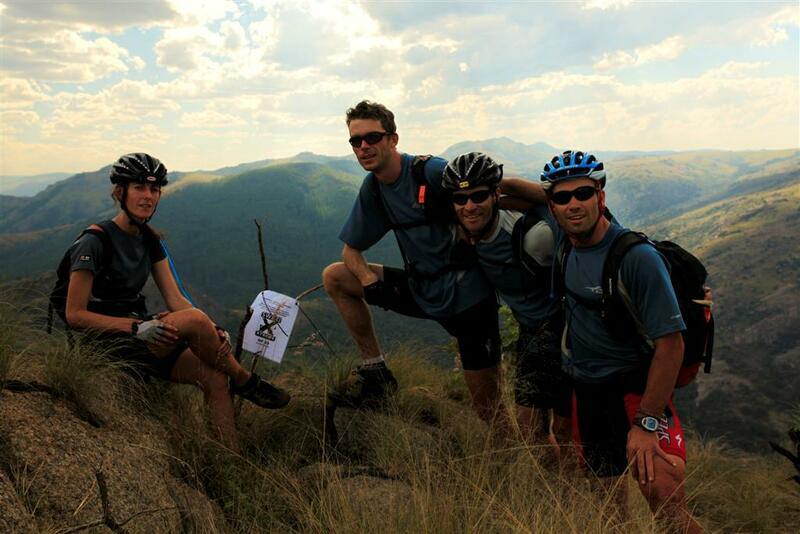 Local Swazi team the Mighty Mavondo, took 1st place ahead of Team Force and Adventure Sports in the SPORT event. 14 out of 29 teams finished officially. The 2002 Swazi Xtreme was held in August. Sub-zero temperatures saw a wild single-track and fast pitch-dark MTB descent leading competitors to the massive new Maguga Dam. Not on the map, this surprise solved the problem of an otherwise impossible 10km upstream paddling leg on the Komati River. Trekking into the wilderness of Malolotja Nature Reserve, the now legendary kloofing leg (upstream nogal) through the Mahulungwane Potholes took adventure to the extreme. Trekking and more MTB-ing along the rim of Ngwenya mountain range brought competitors to a PC at the oldest human mine in the world (circa 43000BC). The “surprise” discovery of an abandoned railway line provided a MTB highway to the south. Another paddle and trek led on to a midnight scramble up Execution Rock at Mlilwane Wildlife Sanctuary. A spectacular abseil and walk amongst wildlife brought the survivors to the finish. 34 teams started the 150km route, 11 finished officially. Hano and Sonya Otto as Team Drifter, made it a double partnered by Nicholas Mulder and PJ Doyer. Kinetic Transcor led Jabberwock home to the podium. Rodney Knight and Garry Townsend of Team Karrimor took 1st pairs, whilst the Business Unusual Girls, lead by Fiona Coward showed once again that they were not afraid to tackle the Swazi Xtreme, cruising home in a solid 7th place overall. On the 28th April 2001, Swazi Trails hosted the inaugural event. At 90km and packed with adventure it got the ball rolling… fast. Wicked downhill MTB-ing, a scramble up the very face of Sibebe Rock (the world’s largest unbroken granite monolith), pot-holing in the Gobholo Cave labyrinth, pioneering a virgin stretch of white-water never previously rafted with a special torrent of hydro release water, swimming to the lip of the 30m Mantenga falls, then abseiling down. Cycling through a wildlife sanctuary as the sun set… and enjoying Swazi hospitality. The ESSA Explorers pair of Piers Pirow and Phillipe van der Leeuw took line honours with NRF Storm’s Hano and Sonya Otto, together Philip Swanepoel and Sakkie Meyer placing as first official team. Fiona Coward, Mandy Scheepers, Jenny Corser and Tracey Saunders proved they were “No Ordinary Chicks” launching an all-girl formula that bugged the opposition for many a year after. 22 teams started and 20 finished.